From Friday afternoon,May second,through Saturday the third, Camphill Mountshannon hosted a conference on Biodynamic Gardening. Friday night there was a presentation given by Finbarr Murphy, followed by an exercise in observation on the shores of Lough Derg. After breakfast on Saturday morning, there was a lecture covering the history of the local Seed Savers chapter in nearby Scariff,combined with a walk around the Seed Saver's grounds. This was followed by lunch,along with much good humor and laughter. Saturday afternoon there was a talk about seed production aimed especially at growers/farmers/gardeners. (Seed Savers is an organization that preserves and distributes the seeds of traditional varieties of fruits and vegetables). Ricardo,our gardener (who helped to coordinate the conference) and Tamara, our co-worker from Russia,attended. In all there were nearly thirty people present for the weekend. Camphill Mountshannon celebrated Easter this year with a predawn trip to Holy Island. We rowed across Lough Derg in the early morning, arriving in time to watch the sun rise. The silence in the morning was quite beautiful, with only the sound of water rippling off the oars. Once we arrived on the island, we sang traditional songs and waited for the sun's appearance over the water and trees. The sky was clear this year, and the sun rose red through streaks of pink, blue and amethyst. Afterwards we rowed to shore and had a very nice breakfast at Inis house, then an Easter egg hunt at Oak house-- a great time for everyone. It’s great to have them here! In December The Raheen Wood Waldorf School held a fundraiser, and Camphill Mountshannon was happy to participate, setting up a display table with many different woven items for sale to benefit the school. Co-workers took turns watching the table and talking to the passers-by. When they weren't working, both co-workers and residents alike were free to enjoy food and drinks, music, craft workshops and much more. All in all, it was a very nice day for everyone, and a good source of funds for the school - which is a valuable asset to the community. After a 100 year absence the White Tailed Eagle is again nesting on an island very close to the harbour in Mountshannon. Richard is a keen visitor to the harbour, where he has become friends with several long term eagle watchers. The rumour is that the eggs have hatched and as of this week (8th. May 2013) we have two new residents in the village! This bank holiday weekend, Scariff was a very lively town during the Harbor Festival. Things started off with a concert by Mary Black on Friday evening. A number of people from the Camphill Community attended, and all enjoyed her music. We also had a stall at the main square on Saturday and Sunday. Unfortunately, it was a rather wet weekend and we were unable to display some of our woven goods( made in our own weavery). Those who had the chance to see what we had for sale showed genuine interest though, and we had many good conversations as a result. Meanwhile the festival went on all day and night. There was a busking competition and there were cooking lessons and crafts activities (blacksmithing, spinning wool, woodworking, basket making, etc) by CELT. The annual Mountshannon Art Festival was held between 29th of May and 7th of June. It is the time of year that we realize that there are so many talented people locally in art, music, craft and the other kind of skills. There were 2 concerts, one comedy show, a couple of art exhibitions, and the presentations by the local youth group(music, fashion show, etc). There were more about films, set dance, story telling and puppet show for children, etc. and More. On Sunday afternoon, there was a green fair at the centre of the park, the Aistear. We participated in the activities and had our own stand. We were there to meet people to let them know who we were and what we were doing in the community so that we could get integrated in the area more. 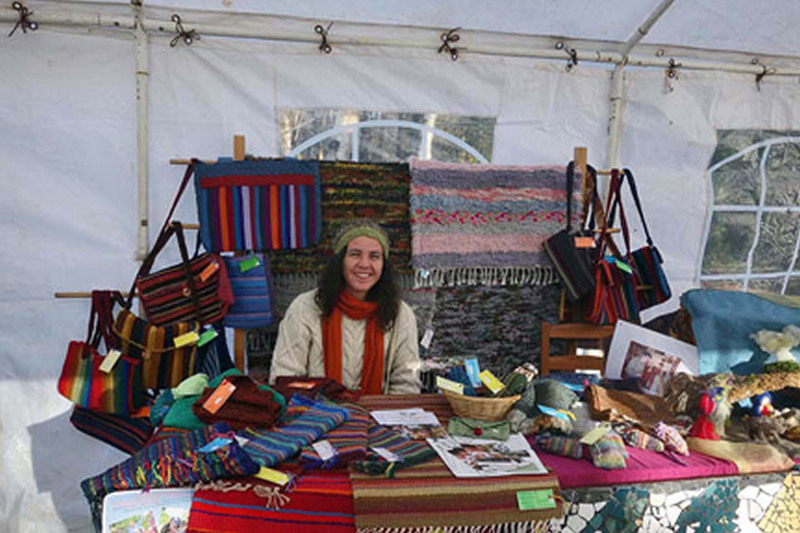 We were selling some products that were made by our people in the weaving workshop. They brought lovely bright colors in the park and they attracted a lot of people to our stand. Another attraction was "The community mosaic" work. We asked the visitors to complete the mosaic picture with some tiles. It was a metaphor to explain about the community life. Each single piece doesn't create something special but together we can. People just liked the mosaic activity anyway and a lot of children kept coming back to add more tiles to make the picture. We were blessed by the good weather and had lovely time listening to nice music in the park. It is organized by the brothers of Charity and it is for 10 weeks session. We are all very keen to go to the drumming session. Our music tutor, Michael, comes with a lot of african drums in all kind of shapes and sizes. This is an instrument that anybody can enjoy playing. We are learning a couple basic rhythms to play together. As long as the basic rhythms are kept, it is quite fine to add different rhythms and sound. It makes the session even more lively. We have had our open day on 17th of April in Clai house. We were fortunate to have very good weather and it made everybody present here happy. Our local friend, Tom Ryan came for support and played irish music. It was wonderful to meet some new people with different interest. It happend that we were looking after a new born lamb and a goat for 2 months and they entertained the children. Our neighbor's horse, Misty, was busy taking some children for a ride. We showed them around the community, including the new weaving workshop building and the vegetable garden. It is Martin's first year to grow some vegetables as a main gardener and we are very happy to see the result. A lot of the visitors made positive comment on the work. Regarding the new weaving workshop, we hope that we will get some more support to finish it off. Before the spring, we have planted about 400 ash trees on the slope in front of Clai house. As the house is exposed on a hill, hopefully, in a few years time, they can give a kind of shelter in windy days. Eventually, they'll provide us some firewood for the hoses. We actually, thought that they might have died after the heavy frost in winter time. It seems that they have started show the signs of life and most of them seem to be well. Just recently, we've got game tables from a friend of the community. Air hockey and football table! We're all very excited. Soon, we're going to a tournament. We have planted about 150 flower bulbs in both clai house and inis house. Daffodils, snowdrops, tulips, muscari, etc. In spring time, they'll brighten our gaden around the houses. We've got 200 ash trees and have been planting them in front of clai house as well. As the house is on top of the hill, it's quite exposed to strong wind in winter time. Hopefully, it gives more shelter in the future.